This mobile is a Calder type looking mobile for me. 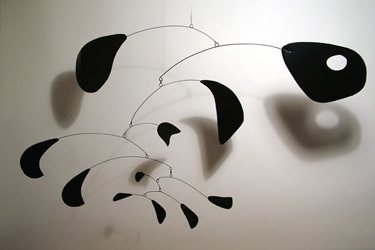 I never copy Calder, but I am inspired! This design was picked by Dwell magazine as Modern Product of the week (see Press). Very exciting to be noticed. This mobile was hanging out my window when I named it, reminds me of the green foliage, very plant and leaf / flower like, blowing in the wind. I also like things that are organic... it has that flavor too! All mobiles and stabiles are handmade of colored plastic and stainless steel. Each mobile or stabile comes with a certificate of authenticity, catalog, hanging instructions, line and hooks. Want different colors or materials? Video: Foleus Mobile in Motion!